Historically, the Granby Four Streets area has been one of the most deprived communities in the UK, having seen a huge decline after the Toxteth Riots in 1981. The group of terraced houses found in Toxteth, Liverpool saw the council forcibly acquire the majority of housing in the area which meant many people in the community lost their homes. These derelict homes were left unused and neglected while the council set them for demolition. The local residents did not give up, however, and over the last ten years, they have fought the demolition plans, making numerous efforts to save the housing including painting the homes, planting greenery, cleaning the streets and generally helping however they could. These efforts led to the birth of the Granby Four Streets Community Land Trust, a campaign group which focuses its efforts on saving the area from its decline. 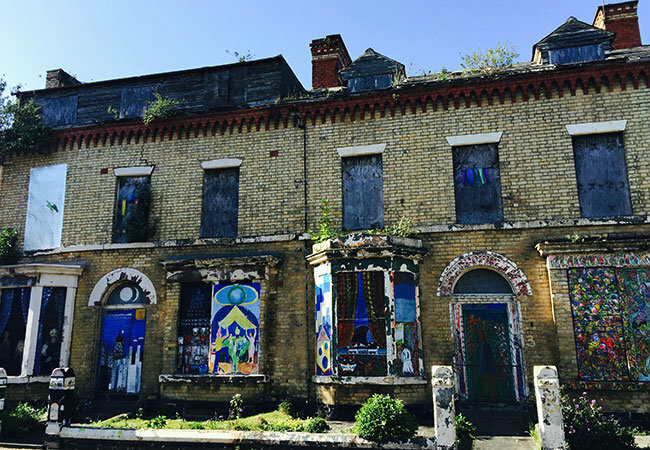 Most recently Assemble, a London-based art, architecture and design collective took on a project to regenerate Granby Four Streets to help restore the derelict housing. Fantastic progress was made, which led to Assemble and the Granby Four Streets Community Land Trust winning the coveted Turner Prize for their efforts in transforming the streets and housing. The project was based upon the imaginative and inspired determinations of the local residents to rebuild and refurbish the area. They not only aimed to help regenerate the area aesthetically but also to create housing, work and enterprise opportunities for the local residents. Much of the labor work had already taken place in fighting demolition, clearing debris and rubbish and planting garden space. Assemble, therefore, used their creative skills to refurbish the housing, creating a number of different imaginative architectural features, furnishing, and other various items in the local Granby Workshop to replace the aged and neglected housing left behind. The work is not finished, even after winning the Turner Prize. Long-term plans are in place to regenerate the historic area, with a new collaboration recently announced between Granby 4 Streets and Assemble to create The Winter Garden & Common House Project, which has recently been awarded £249,619 by Arts Council England. The project will seek to create a shared community owned space, which will include an indoor garden, artist residency space, and community gathering area. At Inkpen Downie we are passionate about the regeneration of the urban landscape, thrusting new life into deprived areas of the inner city. Grandby Four Streets is an incredible and outstanding case study that should be recreated in any city in the UK especially relevant to architectural make up of parts of Essex.